It is a brand new year and I figured I should start 2012 with a fresh start; right at the pastry beginning. For me that’s homemade vanilla extract, probably the most used ingredient in my kitchen after flour and sugar. I always have a stack of beans and bottles of extract. I admit I don’t always make my own, but it is something, like homemade yogurt, that once you make it, you’re ruined to the store bought version. It is easy to make, but to get the best result you have to be patient. 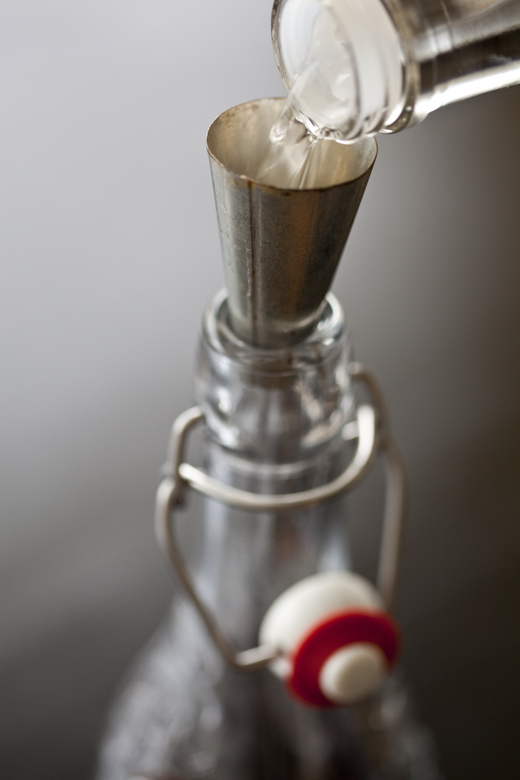 The longer you let the vanilla beans sit in the vodka, the better and stronger the flavor. I let this bottle sit for 5 weeks before opening it, which was a test of willpower I didn’t know I possessed. The result is like perfume, I want to add this homemade vanilla extract to all of my recipes and dab a bit behind my ears. I’ll use it in everything from cakes to cocktails. This year I have only made one work-related resolution…to make more how-to videos on my ZoeBakes YouTube Channel. If you have any ideas for cake decorating, baking, pastry or any other sweets you’d like to see in more detail, please let me know. You can subscribe to my YouTube channel to see all my new videos. Hope they are helpful. It is now 2019 and this remains my goal, but until I get my YouTube game up and running, you can watch my 100+ Instagram videos! Glass Bottle with stopper or cap (the one I used had juice in it and I cleaned it and then sterilized it) – the size doesn’t matter, you can make a large or small amount. Vodka – enough to cover the beans in the bottle you choose. You can also use rum or other neutral flavored alcohol. When you see vanilla extract that is labeled “bourbon vanilla” it refers to the type of Madagascar Bourbon vanilla beans and has nothing to do with the alcohol of the same name. So, Bourbon Vanilla is NOT made with bourbon. Alcohol Free Vanilla – The base for a non-alcohol vanilla is Vegetable Food Grade Glycerin . Clean your bottle and dry it well. If you are using the whole vanilla beans, scrape out the pulp of a bunch of beans. Pour the vodka into the bottle. You can use a Funnel to make sure you don’t spill. I didn’t have one that was small enough, so I used a large round pastry tip. Close the stopper on the bottle and shake the vanilla and vodka to distribute the seeds. The vodka will still be clear for the first few days. Once every couple of days give the extract a good shake to break up the pulp and get the seeds distributed in the vodka. After a week the extract will start to get darker and develop some flavor. After two weeks you can use the extract, but the flavor will be very subtle. At week 3 the color should be amber and the aroma is richer, but waiting for week 4 or 5 is when it gets really exciting. Use it in any recipe that calls for vanilla extract. If you are using it in buttercream, you may want to strain out any of the pulp. You will still have the seeds in your recipe, but any of the stringy bits from the pod will get strained out. The extract can be kept indefinitely and over the months it just keeps getting better. Pour the vodka into the bottle. You can use a funnel to make sure you don't spill. I didn't have one that was small enough, so I used a large round pastry tip. Close the stopper on the bottle and shake the vanilla and vodka to distribute the seeds. The vodka will still be clear for the first few days. Once every couple of days give the extract a good shake to break up the pulp and get the seeds distributed in the vodka. After a week the extract will start to get darker and develop some flavor. After two weeks you can use the extract, but the flavor will be very subtle. Your photos are just terrific and I love those bottles! I made vanilla to give as gifts this holiday. Started it in October. I used those little individual wine bottles, made my own labels and wrapped the necks of the bottles in rafia. It’s a perfect hostess gift, too. I’ve read that it can take up to six months for it to reach it’s peak vanilla flavor. Yes, the longer you wait the better it gets! Hard to wait, but the reward is great! Great post as always! My wife and I really enjoy your blog. For our vanilla extract we bought a large bottle (1.75L) of good vodka and put a bunch of beans directly into it by removing the little plastic cap. 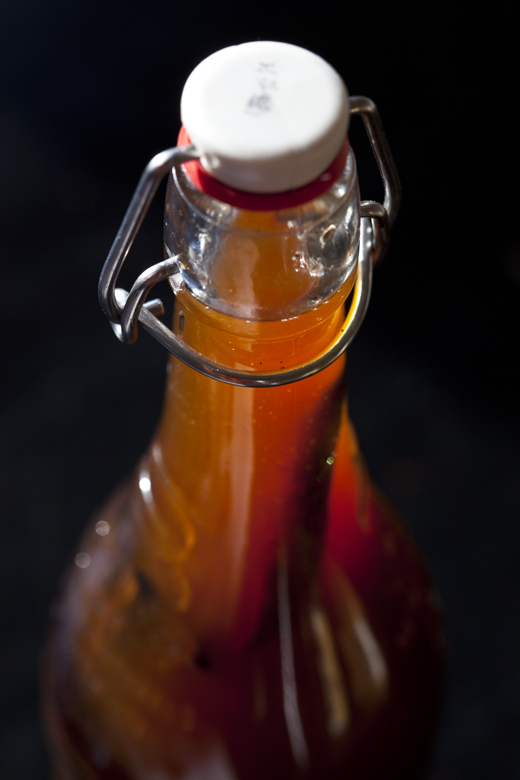 For easy use we pour off a small amount into a regular extract bottle. The rest just sits and gets better every day. Do you make other extracts for your baking? I have made other extracts, but I don’t do it often enough. That will be one of my goals this year! Well, are you Miss Smartyboots using a decorating tube as a small funnel! I thought I was the only person who’s done that in a pinch. Happy new year, Zoë! I brewed mine in Windsor Canadian. . . . I started it in August and gave it as Christmas gifts. I make all my own vanilla extracts (Madagascar, Tahitian, and Mexican vanilla) too. So I came to pick up any extra tips. 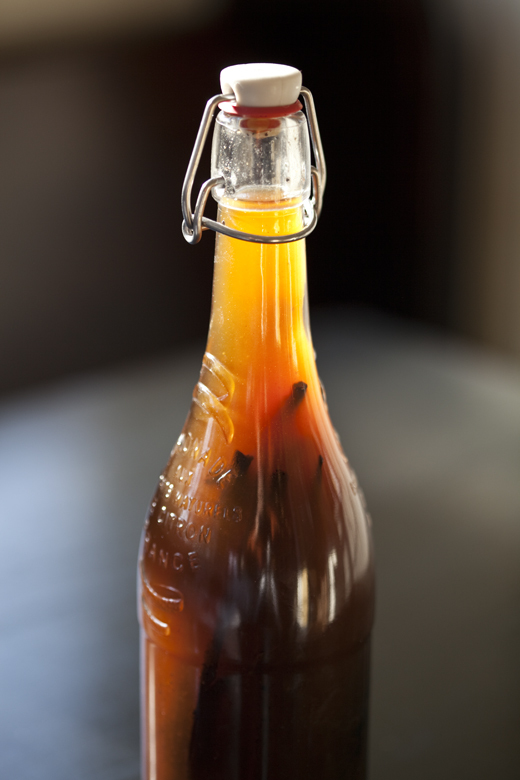 I always allow my extract to “brew” for about nine months with the vanilla beans inside the bottle. I shake the bottles daily for the first week, then weekly. Every Monday is shake the vanilla extract bottle day. I also cut my vanilla beans so that more surface area is exposed for the vodka to infuse. 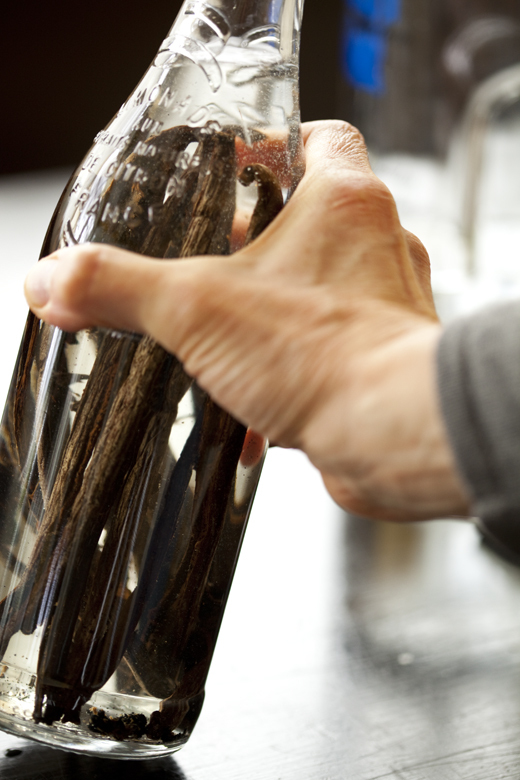 Like Chris I use the original glass vodka bottle and just pour out enough vodka to give the vanilla beans room to fit. When it’s finally done is when I pour the vanilla extract into one of the decorative stopper bottles. 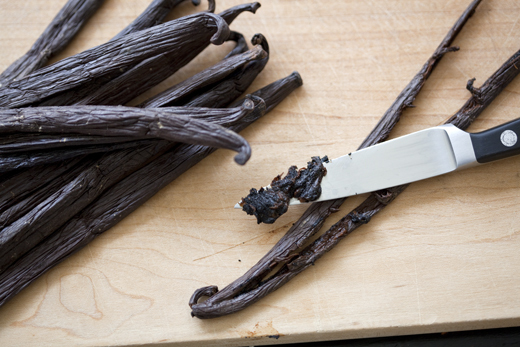 There’s just something about making your own vanilla to use in baking. I also have a bottle of Jim Beam bourbon I infused the same way with vanilla beans. I use that vanilla infused bourbon every year to make holiday fruitcakes. The infused bourbon with vanilla flavor just takes it over the top. Does this keep indefinitely and does the quality of vodka matter? Yes, great minds think alike. I always ask myself WWBD and these little gems come to me. Thanks!!! Great question, I added the shelf life to the end of the post. It lasts nearly forever and just gets better as it ages. I love love love this idea! Thank you for sharing! Any idea how long of a shelf life it has? Or any tips on how to store it for max freshness? Oh… one more question! Does it matter what kind of vodka is used? I want to try making this *so* much! Looks just wonderful! Thank you for this post. This is one of my top priority work to do in new year. Have been reading and searching for good source. Thanks for details with clear pics. Happy New Year to you Zoë and yours! Bonne Annee Zoe, what a great idea! What kind of juice bottle was that? It is gorgeous. Great post, Zoe! I would love to see a demonstration video of your Blueberry Lemon Curd Ring; your photos were so helpful, but video would be nice, too. Happy new year! this is great! I’ve had a bottle of homemade vanilla extract for 3 years now–topping off with vodka as needed. It beats the store-bought stuff for sure! sooo good! We used to do this in Mertztown many moons ago. I love making homemade vanilla. My mom turned me on to the idea of making it a few years ago and ever since I’ve been addicting to making bottles of it. Great post. And I always appreciate your beautiful and informative pictures. A suggestion for your YouTube Channel…a demo about blind baking specifically docking a pie crust and creating a raised edge on a puff pastry shells. I’m always unsure how close together the fork pricks should be or how deep into the crust I should prick it. Every once in a while I get an air bubble and sometimes my crust shrinks even though I use pie weights. Thanks for the great step-by-step info. I will definitely make the homemade vanilla extract soon! Now I’m off to watch your videos! Happy New Year to you and yours! I would like to see in your YouTube Channel , a video Demontrating, how to make a colored Mirror glaze for a mousse cake. This is wonderful! And I was just kidding a friend of mine that there must be a zillion uses for vodka! I just have to try this. Any other extracts you can make this way? I agree about the pie crust video. Thanks for all of the video ideas, I am keeping a list! I’m with the contingent that just drops the beans into the bottle of vodka (pouring off a little to accommodate the addition). I did this for gifts as well, bought cute little apothecary jars online and made labels. I managed to save one bottle for myself. Next time, I’m trying the bourbon version. And, would love to see that pie crust video. Also, tempering chocolate. I recently found a bottle of rum based vanilla in my pantry that I had started about a year and a half ago and it just got pushed back and forgotten. It smells amazing and is the perfect reward for FINALLY organizing my kitchen 😀 I do like vodka better as a base as it doesn’t compete with the vanilla as much as rum does. I didn’t scrape the seeds though, I just split the pods, that’s a great tip to speed things along. Thanks! I’m guessing that this is some pretty amazing vanilla extract. Plus, it looks so pretty. Thanks so much for this, Zoe. I remember making vanilla in Vermont during the commune era. similar bottle and cheap vodka…oh my! The best place to get information about my bread books is on my other website http://www.breadin5.com. We answer questions, have lots of information and videos. Love your info on homemade vanilla! I recently bought a Sam’s Club bottle of Vodka and am waiting for a delivery of vanilla beans any day now! You specifically mentioned it should be in a glass bottle. My vodka came in a plastic bottle. Is that okay to use that or is there a reason the bottle it soaks in should be glass? Thank you! I think the plastic bottle will be just fine. There are some plastics that are supposed to be safer for food than others. You will have to do a bit of research on the web to find out more about that. I have bought very good vanilla extracts in plastic bottles before, so I know it is fine! Thank you so much for this Zoe. I have always wanted to make my own vanilla extract. The tips are really helpful. Do you have a good suggestion as to where to get the vanilla beans, and how much they cost? Does the quality of vodka make a difference in the quality of vanilla? I put a link to some on Amazon. I have also found some great vanilla beans at Costco if there is one in your area. There are many other online sources. The quality of the vodka won’t matter too much, but I always suggest you use an alcohol you would want to drink when using it in your recipes. Thank you for the clear instructions on how to make vanilla. I’ll start mine as soon as I get the vanilla beans I ordered. It will save me a lot of money because I bake a lot of desserts. For the video suggestion, kindy feature how to fold egg whites when making chiffon cakes. Thank you. Would love to see more videos with formulas…why does my pound cake fall sometimes? Why don’t my cupcakes crown nicely? I just read something about too much leavening and structure and strength of the cake vs. falling cakes? What are the %’s of leavening to use? Uses of bread flour in cakes for strength… all sorts of stuff!! I love to learn!!. Thanks for all you do. Do you know how to make peppermint extract?? I haven’t made it before, but I’ll think about it and get back to you. I love this idea. I’m always baking at home, and I hate running out of baking ingredients (especially on a tight budget). Most store bought vanilla extracts have water in them, even if they say “pure”. Do you know how much the water actually affects it? Is the flavor any different without the water? Water won’t add any flavor, it will just dilute the vanilla extract. In the end you will use more extract if you add water to get the same amount of flavor in your recipe. Lovely photos indeed! I’ve been making my own vanilla ‘extract’ for years now w/ bourbon. I’d love to see a video on making babka. I’d like to see how you roll it up and twist it into a ball and make it fit in the pan and come out babka! I prefer to steep mine in brandy or cognac. The rum-based extract I made first just made everything taste faintly like rum cake. I tried vodka next and it seemed fine, a nice vanilla flavor with a sharp finish, but the brandy, oh! Warm, rich, and a bit sweet with a vanilla finish that lasts. My favorite. I also make almond and peppermint extracts using vodka to keep them clear in color. Love this blog, Zoe. Thank you for always posting so frequently! Novice baker question: Once the extract has aged several weeks and is ready to use, should I still continue to shake it occasionally? Should I shake before I use it? The alcohol will be infused with the vanilla, but I like to shake it first to get some of the seeds with the extract. Either way will be tasty. Yes, by all means, but they will not have the same potency, so you may want to mix in some that have the seeds still in tact. I have just started making my extract. From the wholesaler who I purchased them from I was recommended 4-5 bean pods per 8 oz. Does this sound okay to you? Also, I am really concerned about using them in my already tested recipes. Since it is pure vanilla extract will I need to use less than what my recipes may call for? Yes, this ratio sounds right to me. 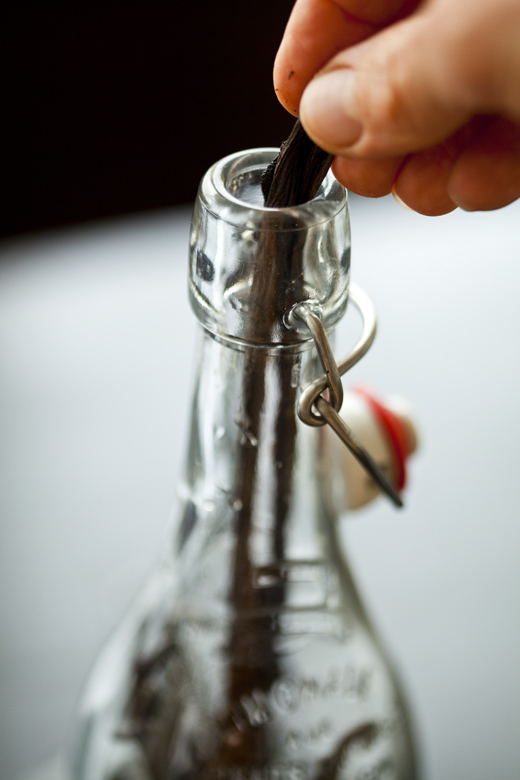 You can use it in the same proportion as you have been with other vanilla extract. You may have to wait for a while before the extract is as strong as you like. I live in a country where its a constant 30+ degrees all year round…which is pretty warm n it might heat up in my cupboard…. So, Is it alright storing it in the fridge? Or is temp not an issue? Where do you keep your vodka? If you store that in the fridge then this should as well. Hi, someone asked about a good place to buy vanilla beans inexpensively. I shop for mine at San Francisco Spice … more reasonable than any where else I’ve found. They also have good buys on other spices, too. I’d also like some other extract recipes. Any that anyone wants to share. Thanks. You don’t know how excited I am to make my own vanilla extract! I buy some quite expensive extract from a dependable source, but to make my own in more volume for the same price is not only economical, but baking smart. Thanks Zoe! PS This is my first visit to your website. I came across it looking for a devil’s food cake recipe. Your site is now favorited, and I’ll be back often! LOVE this! Definitely trying. Can’t wait to search more of your posts for great ideas!!! I should mention, too, that I purchased some vanilla beans off ebay for a fantastic price. 30 for less than $7, including shipping. The beans are shorter (4-6inch) but for the price I really don’t mind. They would be perfect for making homemade vanilla! That is a great vanilla find! I found beautiful, plump beans online for about $0.50 a bean. A steal! I m also making vanilla sugar with them. Can you reuse the beans by just pouring out like 75% of the finished product and then keep adding more vodka? Also I’m sure scraping the pods will make it not as good to reuse, if I dont scrape it itll take longer obviously but will it keep them better to reuse in this way? You can keep topping off the alcohol in the bottle. You will eventually dilute the vanilla, so you will want to add more beans. You don’t have to scrape the beans, but it will take longer to get the flavor. I actually have a few 6 oz. bottles that I made about 5 years ago and haven’t opened them. I only found them a few weeks ago (after a home-move). They’d been in storage (a dark place) for years before the move. Thing is: they won’t open and it’s going to take some gentle-nudging to get the plastic cap to loosen. Would you think the vanilla is good after 5 years of sitting? I made it like you did (vodka and vanilla beans). GREAT tips to share with everyone! Thanks. As long as the vanilla is submerged in the alcohol I think it will still be fine. If there is any mold then you need to throw it out. Can I use gin to make vanilla extract? Thank you for all your lovely posts. I have learnt so much from you. You can, but it definitely will have a gin taste to it. I personally love gin, but it is more assertive than vodka. I hate alcohol & never have it in the house so it would be helpful to have some guidelines for those of us who aren’t familiar. I do love the smell of pure vanilla extract! The thought of making my own is fascinating. A few questions: Is vodka the best alcohol to use to bring out the vanilla w/out adding extra “alcohol” flavors? I guess what I’m saying, is that I don’t want any surprises when I open up my jar 5 wks later. Also, where would you normally store this during the extracting process? Does putting it in the fridge affect the process? Have you done a price comparison of store bought vs homemade? I have found that Vodka is the most neutral flavored alcohol to make the vanilla, but it still has that alcohol “heat” or vapor to it. The alcohol is the best thing to break down the beans for the flavor, and it also preserves them, so they don’t have to be refrigerated. I store the vanilla in a cabinet that is not exposed to much light or heat, but don’t put it in the refrigerator, just not necessary. The price will be subjected to the cost of the vodka, and the beans that you use. There are a variety of vanilla extracts on the market and the price varies quite a bit. Love your site!!! I can tell these recipes are going to be addicting! I see that you said refrigeration is not necessary – just what I was going to ask! Along those same lines, I read on some sites that if you use 70 proof vodka (minimum), it’s not necessary to refrigerate homemade infused vodkas, but some people still do it to be on the safe side. Your thoughts? I have never refrigerated the vanilla, but it won’t hurt it to do so. be careful to not refrigerate the actual vanilla bean as this will harm it. 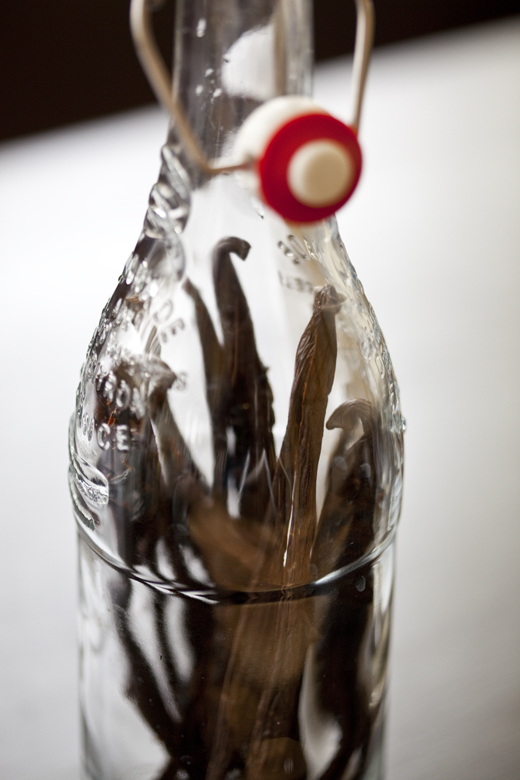 also extract grade vanilla beans are called grade b they are drier than grade A and work better for vanilla extract. That looks nice! I just tried it recently….. IT WORKS!!! Quick question, with hopefully an easy answer… I have never made my own vanilla extract but think this would be perfect for my mothers of preschoolers group. If I buy the 4 oz. bottles for everyone, how many vanilla beans would I need per bottle to make the extract? Kitchen stuff does not come as naturally to me as others, but I am trying 😉 Any help you can offer is great! The more specific, the better. I would do about two beans per bottle. The most important part is to get nice plump beans, not the ones that are dried out. The kind you get will depend on your budget and what is available, but I have good luck with all of them and I tend to use what I have on hand, which is a combination of different beans. Definitely have to try this!! I was wondering how you sterilize your bottles. I’ve seen many different ways-oven, bleach, microwave, pressure canner, etc… I’m trying to find the most effective and safest way. Thank you! I love your recipes and the photos especially of Sicily! I have only used the boiling method for sterilizing bottles. Can you make the extract with vanilla powder? That is a great questions, and I’m sorry to say I don’t know??? I have never used the powder, but now that you bring it up, I will get my hands on some. I’m surprised no one has mentioned the website: beanilla.com. They are by far the best, most informative site for everything vanilla. I bought Mexican, Bourbon and Tahiti beans for making my own extract, using bourbon and the vanilla bean “blend”, starting it now, to give as holiday gifts in stopper bottles, with custom labels. Figured 6 months would make a pretty good infusion! This is such a wonderful find! I had this on my list of to-do’s last year for the holidays, but never got around to it. I’m making myself start early, as this will be a wonderful treat! Thanks for the posting and the lovely photos! Wow! What a great idea! I have never thought to do this before!! Thanks for your clear instructions and pictures! Quick question, you touched on it briefly earlier, how many times/ what quantity would you “re-ad” some vodka to the bottle? I don’t use beans in my cooking so would be buying them specially. Or would you recommend just making a new “fresh” bottle from scratch?? Thanks again!! You can keep adding more alcohol and beans as you see fit. If you add too much alcohol it will weaken the flavor, so you’ll want to occasionally add an more vanilla beans. Hello! I stumbled on your site and have been spending hourssss ogling all the goodies, haha. I had a question- I cannot have alcohol, in any quantity, is there any way to make vanilla extract without alcohol? Or any way to substitute it with something just as good that has not got alcohol in it? I looked in the store for vanilla beans and they were like $7.00 for three beans. So I went to eBay and got them for 50 for $15.00. They are perfect and just started my vanilla extract last night. So excited!!! That is wonderful, enjoy all the vanilla! I have a question for you. What should it smell like in the end? I used 2 cups of vodka and 12 beans and it’s been hanging out since mid July. I can smell vanilla but it still smells heavy on the vodka side. I’m not expecting it to smell as yummy as the store bought stuff does, but I don’t want to give it out and fail. Thanks! Did you give it a good shake and taste it? It should be great to use at this point. If your beans were on the small side or at all dry, you can just add more of them at any point. I add more every time I use vanilla in a recipe. Hi! I made 250 ml of vodka wif 8 pods. Been aging it for 6 mth now. It still smell of alcohol though the vanilla smell is strong. Is it suppose to be like that? Yes, this sounds right. Don’t forget that the alcohol will burn off when you cook/bake with it. How long can you add beans to the original bottle. Do you remove older beans or should you just start a new bottle at some point? You can keep adding beans and topping off the vodka to replenish the extract. If it becomes too crowded with beans then start to swap out some of the old ones for new. Was going to ask you brief about your recipe for home made vanilla extract. how good is the sustainability i mean how long can you leave the vanilla pod in the alcohol.?? In some recipe the have added suger is that something you fell is necesserary to establish or is it just useless to have it . Can be fun to here what you think . I worry about using this in uncooked recipes. It is basically just flavored vodka, correct? Is it still usable in things like buttercream? What is your concern, the raw alcohol? Yes, it is flavored vodka, and the way most vanilla is made. Yes my concern is the raw alcohol. I have made some and it smells awesome. I bake a lot and make my own frosting. Is this ok to serve to kids? Or in a milk shake or a similar concoction? Thanks! 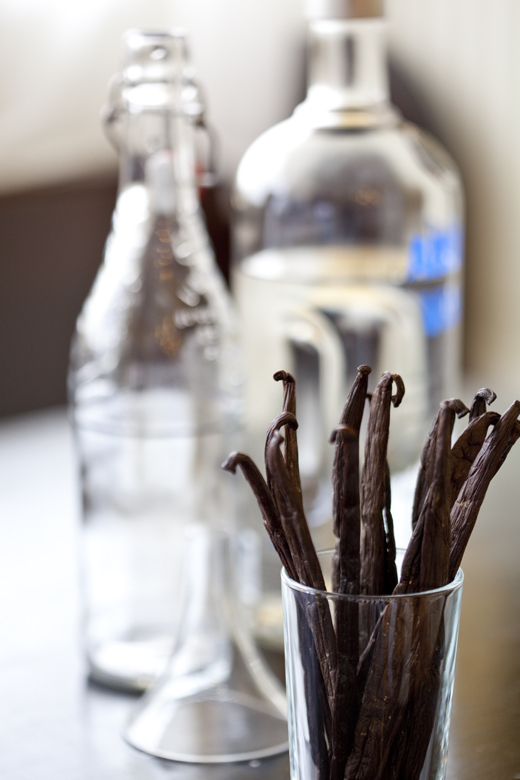 All vanilla extract is made with alcohol, even the kind you buy at the store. There will be no difference between using the one you make yourself and one you can buy. You are typically using such a small amount that the alcolhol has no effect at all. 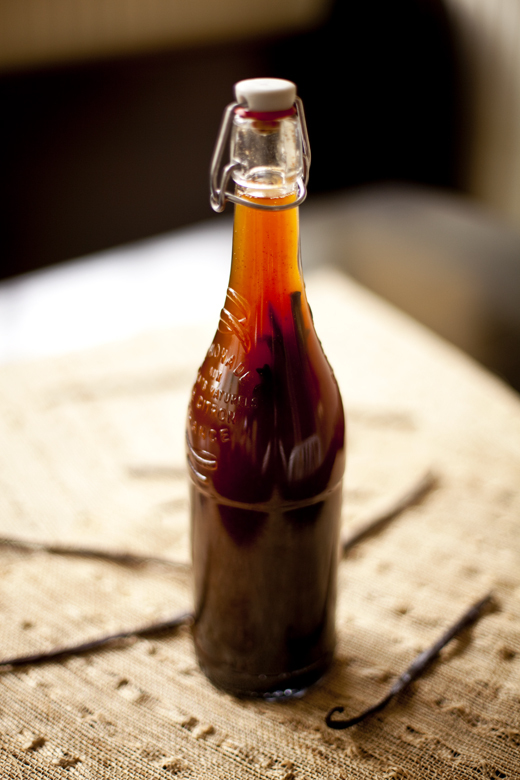 i love homemade vanilla extract. It was one of my first forays into real cooking. I’m now three week in to 8 oz. Jack Daniels with one vanilla bean that is scraped so seeds and pulp are exposed. Still smells a lot like bourbon but will leave it for the next two months and see what happens. Love making my own vanilla. Wish I had used vodka for the first run instead of bourbon but just happened to have Jack Daniels in the stash. How have other bourbon recipes turned out? Did you use more vanilla? I have never tried it in bourbon, I always use an alcohol with very little flavor, so the vanilla stands out more. 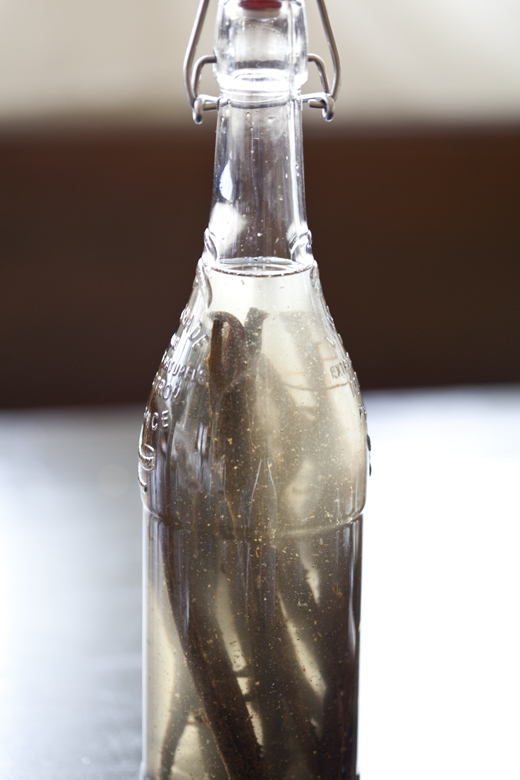 You will need to throw more vanilla beans into the bottle to get a strong flavor out of it. There is a type of vanilla called “Bourbon Vanilla,” but the name refers to the island the vanilla was grown on, not to the kind of alcohol it was steeped in. Few minutes after I poured vodka onto the vanilla bean in the glass jar,I noticed white fuzzy growth attached to vanilla bean. On shaking the jar, the white fuzz is now floating in the jar. Could please let me know if this is normal or the white fuzz is mold. I used a single madagascar vanilla bean and 90ml vodka. My homemade vanilla extract, used with vodka ha developed a brown ring inside the bottle. The vanilla liquid is a little cloudy. Where did I go wrong. Ty very much. This is my first time. Can kids eat the Vanilla? Are you asking because it has alcohol? A typical recipe uses about two teaspoons for the entire thing, so it’s an insignificant amount of alcohol and it burns off in the oven or on the stove, so there are only traces, if any, that remains. Most vanilla is made with alcohol.